Economists often look at the yield curve as an indication of the health of the US economy. Treasury bonds are considered the safest non-cash asset investors can invest their money in and so serve as the place many economists and strategists look to get the broadest feel for how much investors are demanding for taking risks. And so to judge the overall health of the economy and the confidence of investors, economists and strategists look at the “slope” of the yield curve. When the yield curve is steepening, or longer-term yields are rising faster than near-term yields, it typically signals an improving economy as investors believe they can earn better risk-adjusted returns in assets other than Treasuries. 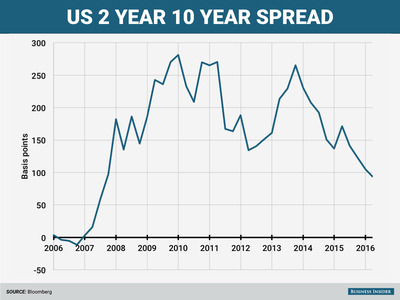 At the other end of the spectrum, a flattening yield curve occurs when short-term rates are increasing faster than long-term rates, suggesting a slowing economy while investors re-trench and opt for the relative safety of longer-dated Treasuries as riskier assets face potential losses. 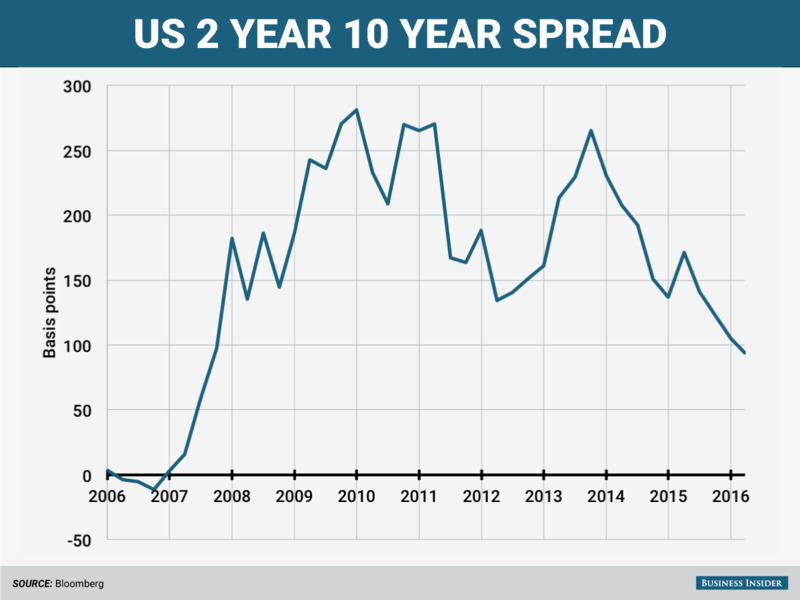 At last look the spread between the 2-year yield and 10-year yield was down around 92 basis points, and at its flattest level since late 2007. 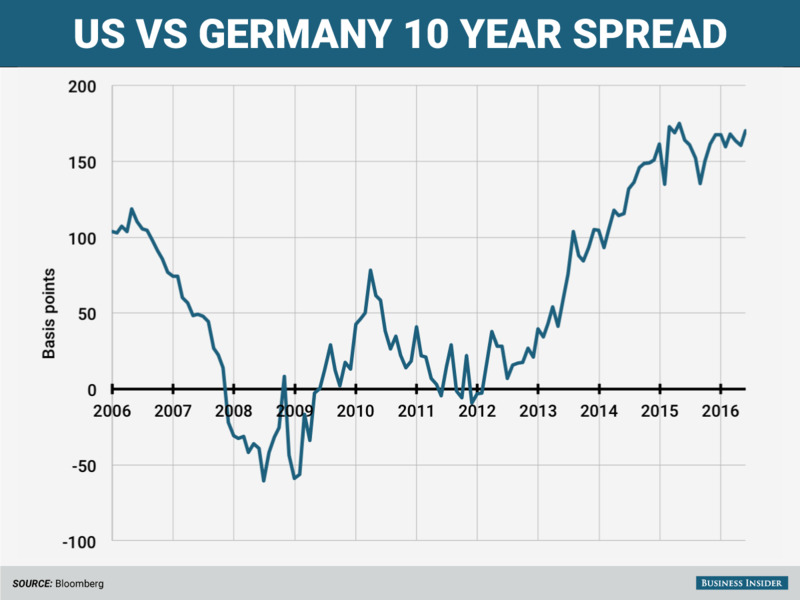 So what is the yield curve telling us right now? 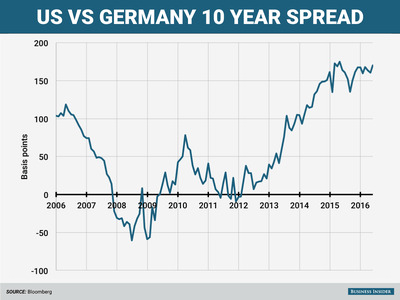 “Let’s talk about the US yield curve, if we were living in a normal world, that would be a massive signal of recession, it’s so flat, and at rates so low, that the only conclusion you could normally devise from the yield curve is that we are on the cusp of a major recession,” Allianz’s Chief Economic Advisor Mohamed El-Erian reporters at a roundtable discussion on Monday. However, these are not normal times. El-Erian gave the US economy a “B+” right now saying that while growth isn’t living up to its full potential of say 3%, its still pretty good at about 2% to 2.5%. On the other hand, Europe still has some work to do. The European Central Bank introduced negative interest rates in June 2014 in an effort to jump start its stagnant economy. But so far eurozone growth remains tepid and inflation is still non-existent. “So my hope is for what is called a ‘Sputnik moment’ – it’s a collective natural realisation that if we don’t do something now, something really bad is going to happen,” El-Erian said.